File TREM-WCM - "Windmills - their Construction and Mechanics. 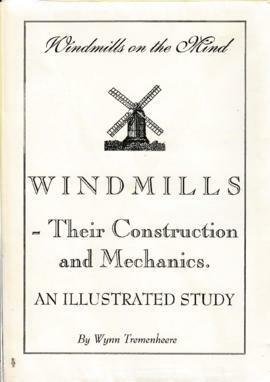 An Illustrated Study"
The book gives a history of the development of windmill technology over the centuries. It details the many design variations found in windmills, with the technical pros and cons for each. Many are illustrated with detailed photographs from 130 mostly British windmills. There is an extensive glossary of the technical terms used, a bibliography and a list of the 130 windmills. The information was collected over many years by Wynn Tremenheere and his wife Mary during their travels around England, starting in 1986. The book is dedicated to Mary Tremenheere (1926-2005). Digitised by the Cranbrook Windmill Association, 2018.